You are here: Home / What we Offer / Hurricane Season Is Here! We have recently entered into the Hurricane Season and there has been little to no activity. Historically, the busiest part of the season is August, September and October. Therefore, we need to remain vigilant and be prepared for the worst. Below you will find suggested actions that your business can take to help best prepare your company and/or your sites. Lewis & Raulerson, Inc.’s suppliers have full-time meteorologists on staff who work with our Marketing Supply Team and monitors potential hurricane activity. 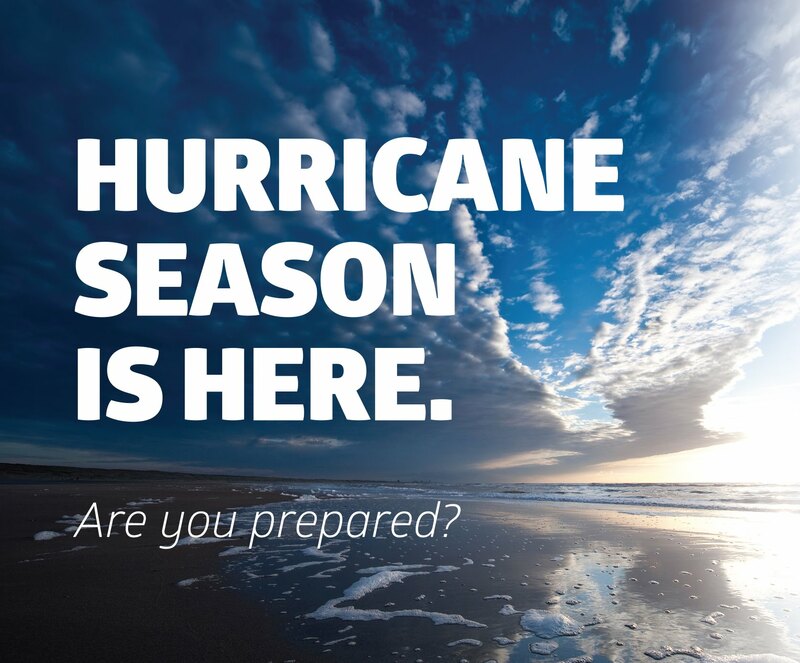 While most hurricanes strike in August, September and October, the official ‘hurricane season’ runs from June 1 to November 30 and we are monitoring weather conditions throughout the entire season. Lewis & Raulerson, Inc. has a cross functional Business Continuity Team, which will be on alert during the ‘Watch’ period or as a supply crisis is recognized and develops. Allocations will be maintained at all primary terminals. As a storm approaches or another supply crisis begins, Lewis & Raulerson, Inc. will develop a plan to manage inventory through allocations to maximize customer supply. Develop an emergency communication plan in case your phones or email are not accessible. Provide secondary phone numbers or email addresses. In the event of a site shutdown, the site should test their underground storage tanks for water contamination before resuming sales. Monitoring – Thankfully with the internet and information that is available to us these days, we typically have enough advance notice to physically prepare. We have had as many as 10 days advance notice when some of the storms form off the coast of Africa. Our plan calls for us to measure our response against the Threat Level (Hurricane Level 1,2,3,4, or 5). Regardless of the level of the storm, five days from landfall (or less with notice), we will request that you go to a keep full basis. If you go to a keep full, this will allow us to fairly and equitably manage inventories with the potential allocation issues. If we have more than five days lead time, we may call you and request that we bring extra fuel in anticipation of allocation issues. If a storm is rated or projected at hitting land at strength of 3 or greater, we will be looking to evacuate our employees (and their families). We have identified several “safe havens” that we will try and secure rooms as soon as possible. In addition, each of our terminals has a portable generator that will help keep it powered during a storm. We also have a fully operational permanent generator at our corporate office that powers the entire plant. Now that our dispatch has been centralized, communication should be improved. However, immediately after the storm, our recovery team will be visiting each site and reviewing damage and determine what sites will be open and which sites are not going to be open. As you are probably aware, Florida law dictates that any station on an evacuation route must be equipped with a manual transfer switch to allow a portable generator to be hooked to your site, if applicable. If you have not had this switch installed, I would highly recommend doing so as soon as possible. As the storm passes, terminals re-open, and it is deemed safe for deliveries to resume, we will resume deliveries as soon as the conditions are safe. We will begin calling your sites as soon as possible after the storm passes to determine whether or not you have power and whether or not your parking lot is flooded. In the event either of these two conditions exist, please notify us. We are aware of a couple of sites that are determined to be emergency response (ER) sites. These will take absolute priority in getting fuel. If your site is considered an ER site and we do not currently acknowledge it as such, please notify us as well as provide us with a letter stating such from your municipality. Please refer to the EPA underground storage tank (UST) Flood Guidelines at http://www.epa.gov/oust/pubs/ustfloodguide.htm, in order to address the potential risk of UST system displacement and water from entering the system, owners and operators may consider taking these precautions if there is a threat of flood. We have also provided additional information regarding phase separation and water finding pastes can be found at http://nationalpetroleum.net/Ethanol-Water-Phase-Separation-facts.pdf. I would also recommend reviewing your insurance coverage with your broker. Does it include flood? Do you have business interruption insurance? Are your limits adequate? Business interruption insurance can insure your extra expense associated with clean up, lost profits and shortages due to supplier issues (fuel, electricity, etc.). It is often over looked and can be purchased easily. While we have no control over the weather, we do have the ability to plan, prepare, and execute a response to natural disasters. If I can be of any assistance to you, please give me a call. As always, we appreciate your business and the entire staff of Lewis and Raulerson, Inc. is ready to serve you.